~ Place a few rocks in the bottom of your bowl. Although the succulents don’t need to be watered often, it is important for drainage when you do need to. ~ Add a small layer of soil to overtop of the rocks. 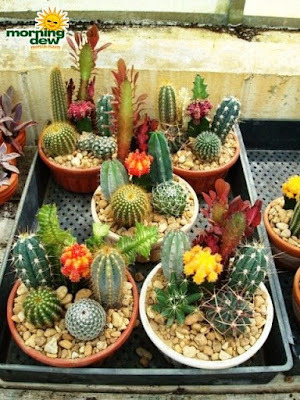 ~ Remove your succulents from their pots and loosely soften the roots. Figure out where you want your succulents to be placed and make a small hole in the dirt for them. Add another layer of soil overtop to cover the rest of the roots. ~ Once all of your succulents are in the bowl where you want them and they have been covered with soil and a layer of rocks over top.